It is some three years since we visited Henllan to find Ffynnon Wen, what would appear to have been an eighteenth century bathing house on the banks of the river Meirchion. This new article rambles around some of the other wells dotted around the village before coming to no particularly firm conclusions. Henllan lay on the route of St Winefride’s pilgrims following her supposed route to Gwytherin from Holywell. The story tells that she first visited Deier at Bodfari, who quickly passed her on to Sadwrn at Henllan from whom she received instructions to join Eleri’s establishment at Gwytherin. Thus the route lies on the pilgrimage trail for followers of St Winefride, although there is no evidence of significant pilgrimage traffic until the post Reformation period. Gray Hulse  warns us that much of the factual basis behind the story is weak, the best dates for any of the historical characters involved place over 100 years between Winefride and Sadwrn and Deier, but on the well trail we find that adherence to the facts is rarely allowed to get in the way of a good story. Gray Hulse notes that up to the 1620s there was a record of a relic of St Winefride being kept in Henllan, in the hands of a private Recusant family, an item which it is claimed had cured more than one visitor. .. the parish church remarkable for the schism between church and steeple, the first having retreated into the bottom, the last maintains its station on the top of the hill. There is little evidence around the village that it ever lay on a pilgrimage route. Some old field names remain, we find a residential street with the name Maes Sadwrn, and on the Denbigh road leading up the hill from where a friary once stood there is a Maes y Groes. Naturally the community had a well dedicated to Sadwrn. Lhuyd’s inventory from the 1690s records Sadwrns’s well as being in Foxhall’s grounds. Foxhall remains there a large estate to the south of the town but the traditions of the well have long since faded. There is an ancient spring in the bank on the left hand side of the road from Denbigh to that part of Henllan called ‘Bwlch Sadwrn’ and near to Foxhall House. 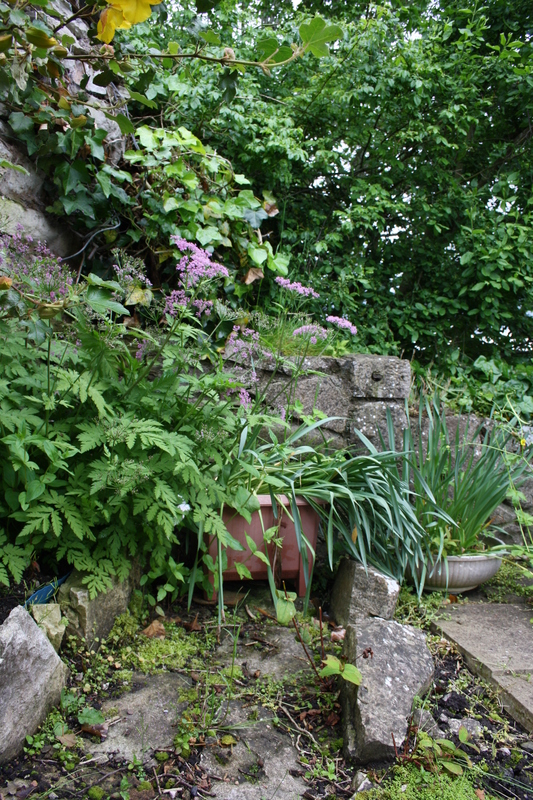 A low footstone 3 feet wide stands in front of the well and the well chamber is protected on all sides by rough walling. 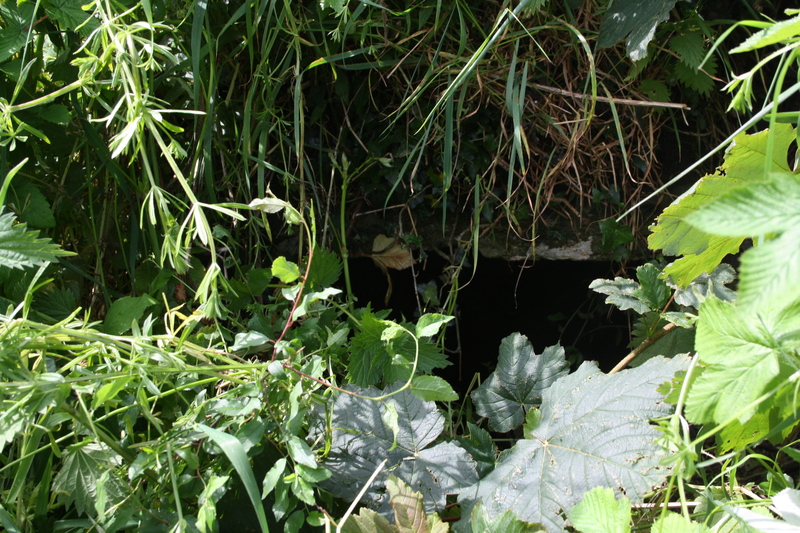 There is provision for and evidence of former overflow on both sides of the road, but only a little water is now to be found at the bottom of the well. The well is marked on the Ordnance Survey maps from the earlier part of the 20th century although it disappears from later editions. A CPAT survey in 2003 concluded that the area had been levelled and all traces removed. That need not deter us however; fruitless searches are our forte, Hunting along the bank is difficult. Cars fly past and the verge is very overgrown, it is in fact managed as a nature reserve. There was certainly no sign to be seen of a 3 foot wide footstone. 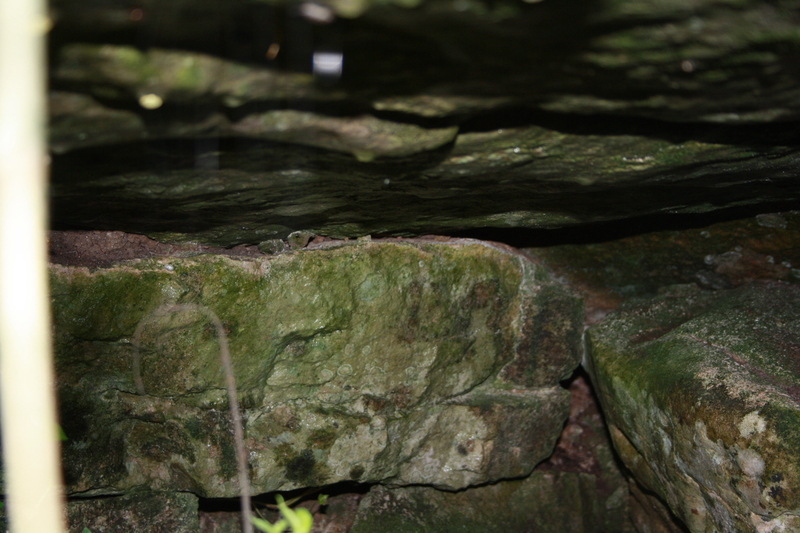 There is however, a chamber built into the bank at the point where the well was recorded. A stone lintel supports the bank above the cavity which itself appears to be stone lined inside the bank. There was no sign of any water within the chamber. Now I could not make up my mind whether this is indeed the final remains of the spring associated with this well or just some old drain from the fields, but I can’t say how carefully those CPAT people looked, it does however tally fairly accurately with the location indicated on the maps and that in itself is reason enough to note it here. So, this well does, just, fit the criteria of being on Foxhall ground, however there is no clear evidence to suggest that it is Ffynnon Sadwrn, in fact it is very unlikely that it is. A previous occupant of Foxhall has stated that the well has been lost I have heard a suggestion that the well was on the path between Foxhall and Henllan and whilst maps do show that there are several other springs marked on the map on the Foxhall estate, none on a direct route between the house and Henllan. One appears to be in the middle of an alder grove with signs of a path leading up to it which might have been nice to investigate, however unfortunately most of these are on private land and thus inaccessible. Back to the church now and outside the church door a mediaeval font has been mounted. The story told is that this was removed from the church in the 1850s following the donation of a newer, more ornate model. 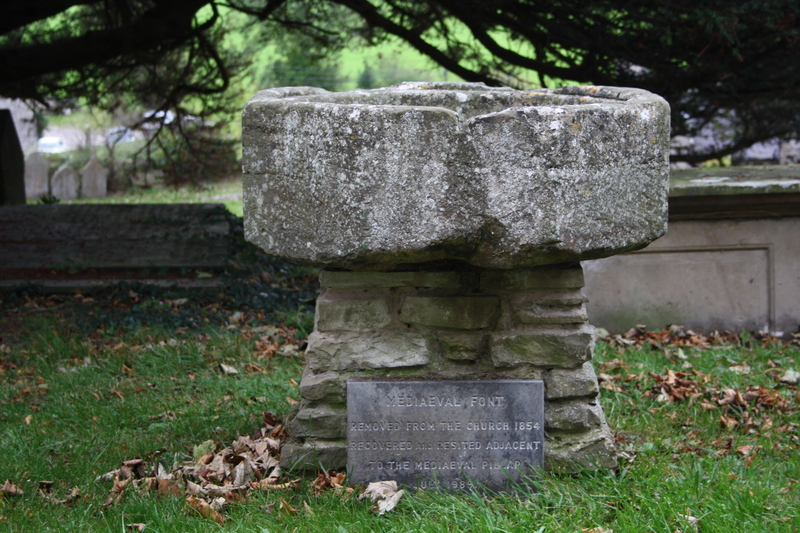 In a fit of cultural vandalism the old font was dumped in another well in the grounds of Llys Meirchion. It was not until the 1980s that it was recovered and placed in the church yard. Ffynnon Meirchion, which has also been known as Ffynnon Abermeirchion, is regarded as the source of the river Meirchion which flows northwards for a few miles to join with the Elwy. Gray Hulse has reviewed the history of this amongst a number of local wells. In later centuries it represented a boundary marker, named and visited during the annual procession around Denbigh. He discusses the common use of wells, and other water features, as fixed, named reference points in the landscape which are regularly used as boundary markers. They are used for that reason, that they are fixed, indestructible features in the landscape that can be named and remembered from generation to generation. Although this use does not impute any specific holy nature to the well, the parish procession would stop at such points where the priest would say a prayer or bless the water as a symbol of the parishes prosperity. Thus the use of such wells is not necessarily evidence of any specific holy associations with the well although such properties have sometimes incorrectly been attached often at a later date. However, Gray Hulse does point out that historian D R Thomas noted the one time presence of a chapel at this well which may give it some greater significance. There are no claims for sainthood for Meirchion, the name arises commonly locally, specifically in the nearby village name of Tremeirchion, and it is assumed it is derived from the dark ages ruler Meirchion Gul. Ffynnon Meirchion still exists within the grounds of Llys Meirchion, It avoided being recorded by Royal Commission’s inspectors so must have been considered of less importance or interest by that time. The best description I have of it is that it is enclosed in a small brick building topped off with concrete. So rather unassuming, though sadly being located within a private estate it was not possible to visit it to confirm this. The last well on our tour lay just outside the church wall. It was in the back garden of a house built into the church wall. Although there are no claims to any spiritual use of the well, it was probably attached to the church as a water source. A path and stairway, long since closed off, have once provided a link to the well directly from the churchyard. The fact that parish paid for it to be capped off in the 1930s may suggest that it was church or public property at one time. It now lies beneath paving stones in the garden. The picture below shows the bottom of the pathway to the church, the steps now gone and blocked up by a wall and hedge. The well is under the paving stones to the right. Thus at Henllan we find nothing but memories of wells and springs in all guises formal and informal. The well dedicated to the saint of the community, possibly once known for its healing capabilities or an important stop off on the pilgrim’s trail for both local residents and nationally. A spring tapped and developed by a local landowner, maybe from the Garn estate, keen to enjoy the health benefits and the fashion for outdoor bathing. A well once used as a marker in the landscape, to denote parish boundaries and visited as such, although possibly with a deeper and more important history. Finally wells as water sources, pure and simple. The house Bryn Fynnon lies to the south of the church; wells are marked down Lon Wilkin and then there is the well we visited – linked to the churchyard situated beside a pigsty. Probably used by the clergy, those responsible for the churchyard and maybe even church goers in days before public health was such an important concern. I said at the outset that there was no firm conclusion other than a demonstration of the importance of water for so many reasons. I’m sure there is more evidence to be had to point us to the history of the wells in Henllan. This article was much inspired by some of the messages I have had lately through the website. As always any further information that can advance the record of these wells would be gratefully received. Tristan Gray Hulse (2002) The Documentation of Fynnon Ddeier: Some Problems Reconsidered. Living Spring Journal. CPAT Historical Settlement Survey – Denbighshire 2014. Henllan. CPAT Report 612 Early Medieval Ecclesiatical and Burial Sites in Mid and North East Wales. Field Assessment and its Impact on the Overall Study. 2004.